The “Artes Liberales Institute” Foundation has since its onset been an “incubator” of innovation in Higher Education. It was created to support innovative educational methods, especially in the spirit of Artes Liberales, and to stimulate the growth of the Center for Studies on the Classical Tradition in Poland and East-Central Europe (later transformed into the Institute of Interdisciplinary Research “Artes Liberales”) as well as the activity of the Inter-faculty Individual Studies in the Humanities (MISH, 1992), also initiated by the above Institute, and of the International School of Humanities (MSH, 1996). The Foundation finances the design, implementation and testing of innovative educational projects. As they prove their merit in academic practice, they gain autonomy and, by becoming more closely integrated into the structure of the University, they shift to University funding. The first innovation financed by the Foundation, which after a successful implementation and testing period has already become an integral part of the University of Warsaw and other participating universities, is the Inter-faculty Studies in the Humanities. 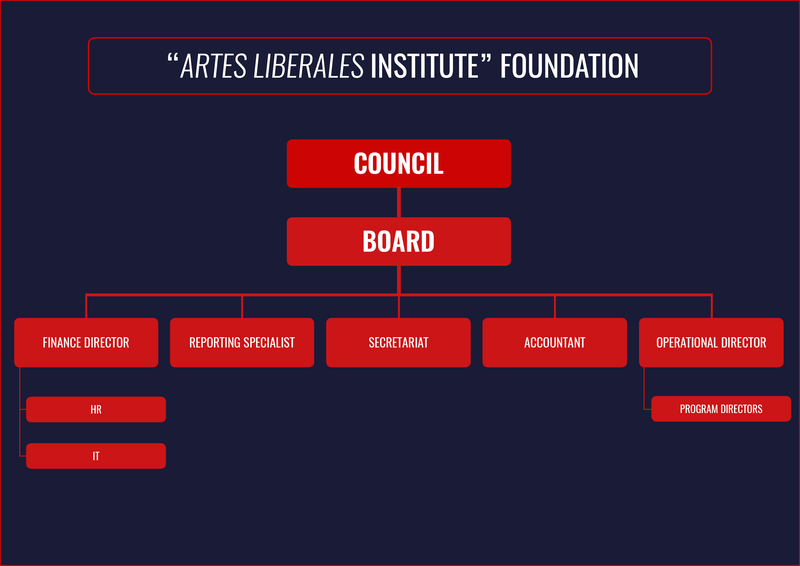 The Foundation’s second initiative is the »Artes Liberales« Academy, on its way to organizational autonomy within the University since the academic year 2017/2018 and to be funded by the University. At present, the largest innovative program financed by the Foundation is the Collegium Artes Liberales and the Artes Liberales Studies led under its auspices. The financing of the program, highly assessed and recognized as the “flagship” of Polish academic culture, is being gradually taken over by the University of Warsaw. The Foundation is engaged in ever new educational initiatives, inspired by the practice of earlier programs and aimed to meet the expectations of the wide non-academic social and academic community concerning the education of the citizens of the future. Below find a short calendar of activities within the two decades of the Foundation’s operation. Thanks to its innovative educational programs, the Foundation has no doubt exerted a lasting impact on the development of education and research at the University of Warsaw and in the entire Polish Higher Education system. The “Artes Liberales Institute” Foundation is established by Jerzy Axer and Jan Kieniewicz. Decision of the District Court for the Capital City of Warsaw, 16th Economic Division, concerning the entry of the Foundation into the Register of Foundations. The Foundation starts to finance the implementation and testing of the program of Inter-faculty Individual Studies in the Humanities and the International School of Humanities. Signature of a cooperation agreement concerning educational initiatives of the University of Warsaw and other Higher Education Institutions in Poland and abroad by the Institute of Interdisciplinary Research “Artes Liberales” and the University of Warsaw and the “Artes Liberales Institute” Foundation. 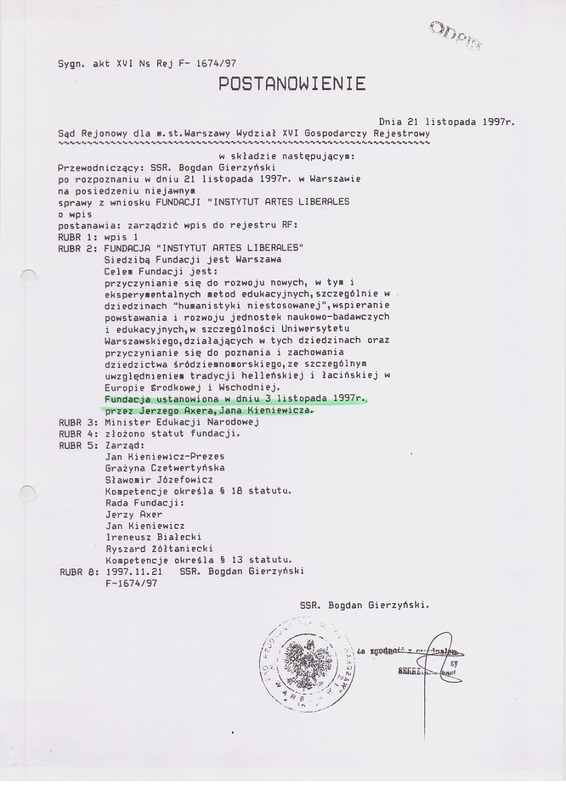 The Foundation purchases a building at Stefana Jaracza 10/28 in Warsaw, its main premises. The Foundation becomes a public benefit organization. University of Warsaw Senate Resolution No. 211 launches Artes Liberales Studies and entrusts the program to a confederation of the faculties in the College of Inter-faculty Individual Studies in the Humanities. An agreement concluded between the University of Warsaw, The Endeavor Foundation (New York) and the “Artes Liberales Institute” Foundation concerning the establishment of the Collegium Artes Liberales within the structure of the Institute of Interdisciplinary Studies “Artes Liberales”. A resolution of the MISH Council, entrusting the administration of Artes Liberales Studies on behalf of MISH to the Institute of Interdisciplinary Studies “Artes Liberales” due to the establishment within it of the Collegium Artes Liberales. University of Warsaw Senate Resolution No. 8, entrusting as of 1 October 2016 the administration of Artes Liberales Studies to the Faculty of “Artes Liberales”, set up after the transformation of the Institute of Interdisciplinary Studies “Artes Liberales” (without the responsibility for the MISH College program). Transfer of the financing of the »Artes Liberales« Academy, an innovative program implemented and tested by the Foundation since 1999, to the University of Warsaw, via the Faculty of “Artes Liberales”. The Foundation Council amends the Foundation’s Charter and adopts its consolidated text, in force to date. The new Charter lays the groundwork for the future operation of the Foundation by precisely defining its tasks and the manner of functioning of the Foundation’s bodies. The Foundation Council changes the functions of the members of the Foundation Board and appoints Dr Maria Wiśniewska to the position of Deputy Chairperson of the Foundation Board, entrusting her with managing the Foundation’s operations. The Council moreover entrusts a Board Member, Fr. Prof. Andrzej Szostek with ongoing analyses of the ethical aspects of the Foundation’s activity and with drafting relevant recommendations for the Foundation Board and the Foundation Council.